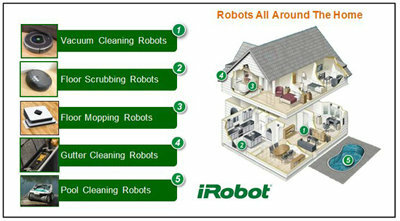 Take the work of out of cleaning your pool with the iRobot Mirra 530 Pool Cleaning Robot. Mirra uses enhanced robotic technology to deep clean pool surfaces and water, removing leaves, hair and dirt, as well as algae, pollen and bacteria as small as two microns. Mirra has a self-contained vacuum, pump and filter, so it won’t strain your existing systems. An added bonus is energy cost savings from running these systems less frequently. And because there’s no installation required, you simply drop it in the pool, turn it on and let it go. Designed to clean any type of residential in-ground pool, Mirra 530 lifts grime off the pool floors and walls with a PVC scrubbing brush, including at the water line where oils and bacteria can build up. Just drop it in, press the CLEAN button and Mirra is off to work, pumping and filtering 70 gallons (265 litres) of water per minute – that’s over a gallon a second. It also reduces heated hot spots and keeps chlorinated water evenly distributed as it disburses filtered water throughout your pool, capturing debris as tiny as two microns. By comparison, the diameter of the average human hair is 70 microns. PVA wheels keep Mirra grounded on slick pool surfaces. Mirra 530 uses enhanced robotic technology, including iAdapt Nautiq Responsive Cleaning Technology For Pools to size up the approximate dimensions of the pool, then chooses the optimum cleaning cycle for maximum efficiency. Mirra provides the most thorough cleaning by making multiple passes over the entire inside of the pool, navigating obstacles, climbing walls and stairs, changing directions when necessary and making sure not to tangle its power cord. Mirra 530 is the easiest pool cleaning robot to use and maintain, offering single push-and-play operation with the iRobot CLEAN button. When the job is done, two quick-drain valves on the bottom of the robot allow for fast draining and lightweight handling. It’s easy to clean the debris out of Mirra’s two, top-load filter canisters. Simply lift out the basket and open the trap door, which doesn’t require the removal and dumping of pool water and chemicals into the environment. Optional large-debris canisters are available for heavier pool clean-ups, including during the fall season. Mirra is easy to move from the pool to a storage area with the optional carrying caddy. Dual Top Load Filter Canisters – Easy-to-remove canisters allow you to quickly access and remove debris – simply lift out the basket, open the trap door and take out debris. iAdapt Nautiq Responsive Cleaning Technology – Mirra 530 provides complete pool coverage and a thorough cleaning with the iAdapt Nautiq Responsive Cleaning Technology. This technology sizes up the approximate dimensions of the pool then choose the optimum cleaning cycle for maximum efficiency. This system also allows the Mirra 530 to make multiple passes, avoid obstacles, and climb walls and stairs. Active Scrubbing Brush – The PVC scrubbing brush is actively geared to the motors of the robot. 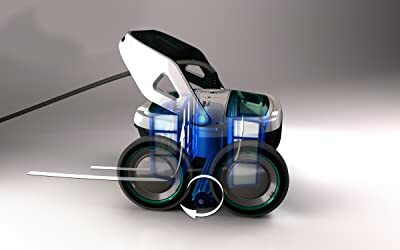 This 4:1 gear ratio provides active agitation to the pool surface as the robot moves, allowing Mirra to scrub and lift leaves, hair, dirt, algae, and bacteria off the pool floor and walls. PVA Wheels - These wheels give Mirra sponge-like traction on slick pool surfaces like ceramic or vinyl. Optional rubber wheels provide optimum performance on rough surface like gunite. No Installation Required - Simply plug Mirra in, drop it in the water, push the CLEAN button, and watch it scour your pool from top to bottom. The self-contained vacuum, pump, and filter system work without suction lines or other modifications to existing systems, so your pool’s systems work less, require less maintenance, and are less costly to operate.